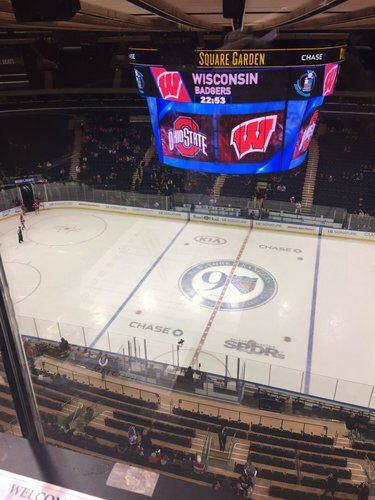 The University of Wisconsin men's hockey team faces Ohio State in New York City's Madison Square Garden. 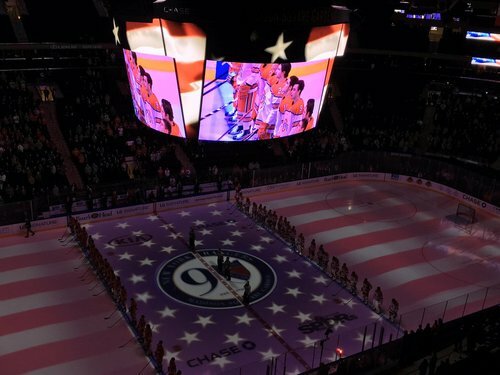 Live from New York, it's Saturday night (hockey)! The #Badgers next opponent, Illinois, drops a 71-67 decision at Penn State. The Illini (13-9, 3-6) host UW (18-3, 7-1) on Tuesday night. 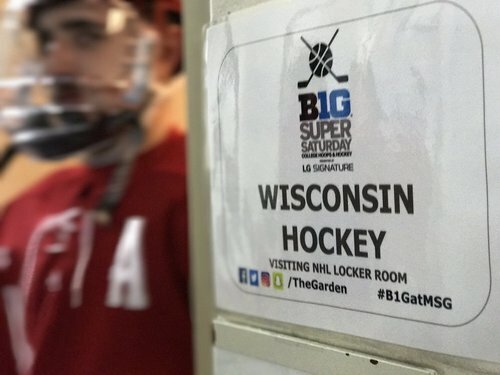 Wisconsin and Ohio State drop the puck in Madison Square Garden at 6pm (CT) on @BigTenNetwork . Starting lineups being announced. They are treating it like an OSU home game, just like earlier with Rutgers. By the way, count your blessings and thank whatever god you pray to, @B_Ehrlich11 is tweeting tonight. @E_Levy3 is writing. 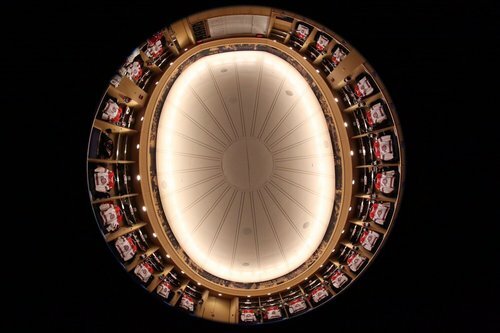 Hockey pucks. We're ready at @TheGarden . Watch on BTN. 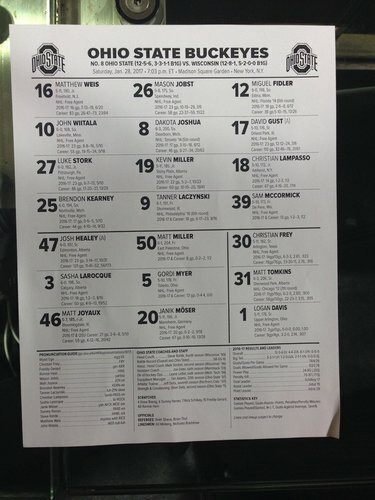 Links: go.osu.edu/mhkygameday. We're underway! 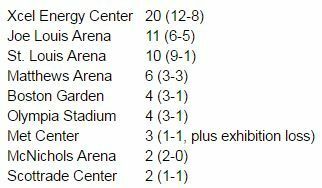 12-8-1 Badgers take on the 12-5-6 Buckeyes of Ohio State! 4 minutes in, not a whole lot going on. 4-1 shots for UW but no good chances on either end. First four minutes gone by in the opening period with neither team with any glorious chances yet. 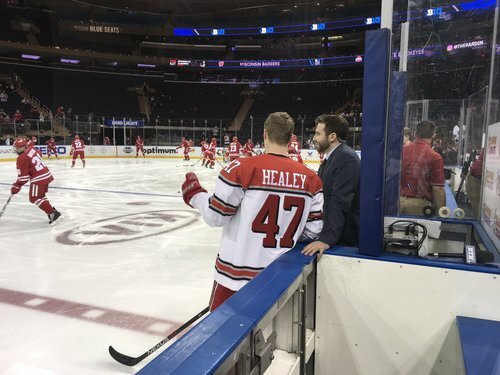 There's a bit of a CCHA vibe here as I'm sitting right below @PletscHockey and caught up a little with @LeannBP_OSU . The game is good, too. No score through the opening 5:50 at MSG. #Badgers with five shots to two for Ohio State. Wisconsin had an odd man rush with top line, but Frederic's cross ice pass was broken up. 0-0, 11:40 in first. Badgers doing a good job of shutting down the neutral zone and limiting OSU attacks. UW leads in shots 5-3 with 11:13 to go in the first. #Badgers will go on the power play at 10:58 in the first. Ohio State's Miguel Fidler sent to the box for elbowing. Kunin tries a one-timer but a strong block by an OSU skater stops it from reaching the net. Badgers draw an elbowing call and they will have their first power play of the game. Zimmer just had a point-blank chance off a pass from Johnson, but couldn't finish. Nice save by Ohio State's Christian Frey on a shot from point-blank range by UW's Max Zimmer.